158 pages | 9 B/W Illus. 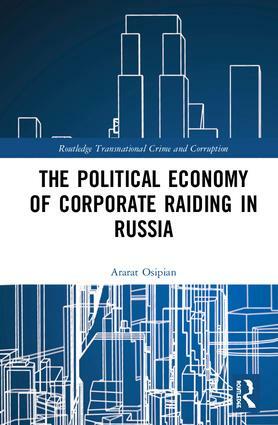 Corporate raiding – the shocking phenomenon whereby criminals, business rivals and even state bureaucrats visit business headquarters and force owners or staff to transfer business assets, land or property – is an increasing problem in Russia. This book, based on extensive original research, provides a comprehensive overview of this activity. It describes the nature of corporate raiding, provides numerous case studies and discusses the role of the state and government officials. Overall the book argues that the prevailing climate of business and government in Russia leads to a situation where control is closely linked to corruption and coercion. Ararat L. Osipian is Fellow of the Institute of International Education, United Nations Plaza, New York and Honorary Associate at the University of Wisconsin-Madison. He is the author of The Impact of Human Capital on Economic Growth by Palgrave Macmillan and studies corruption globally.